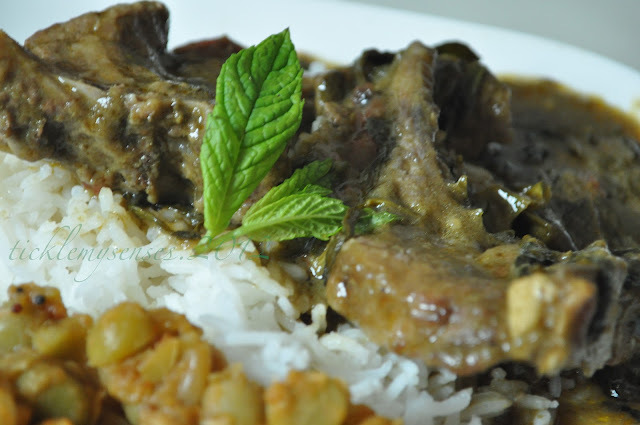 This super delicious easy to prepare mutton or lamb curry is yet another addition to the numerous dishes that can be conjured up using the flavoursome and versatile Mangalore Green masala paste. The fresh fenugreek/ methi leaves adds a new dimension to the curry and also perks up its nutrient profile. As in most of my meat preparations, I tend to lightly dust the meat/chops with flour and then lightly brown them in some oil before making the gravy. This step creates a wonderful caramelised surface that seals the meat and retains all of its tasty, flavoursome juices. I learned this trick from the Brits, the secret to juicy and succulent meat in stews. The flour also helps to thicken the gravy. 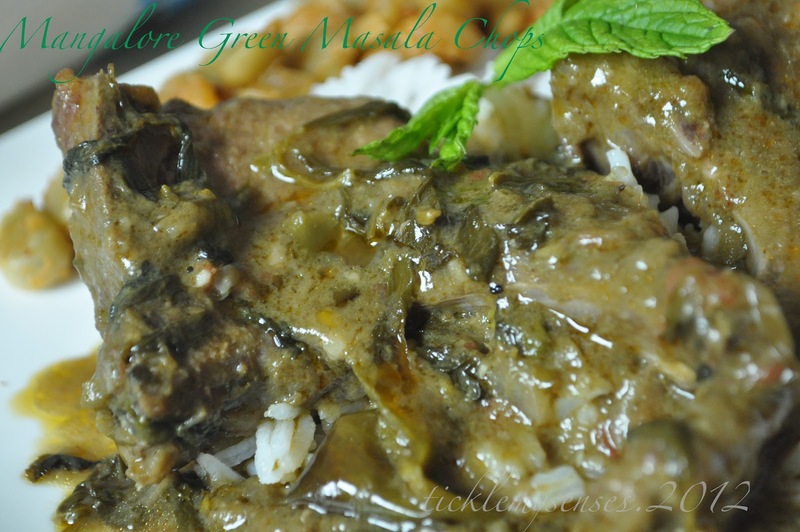 For more ideas and tasty recipes using Mangalore Green masala paste, checkout the much loved Mangalore Style- Green Masala Baked Fish and Spicy Green Masala Griddled Lamb Chops. 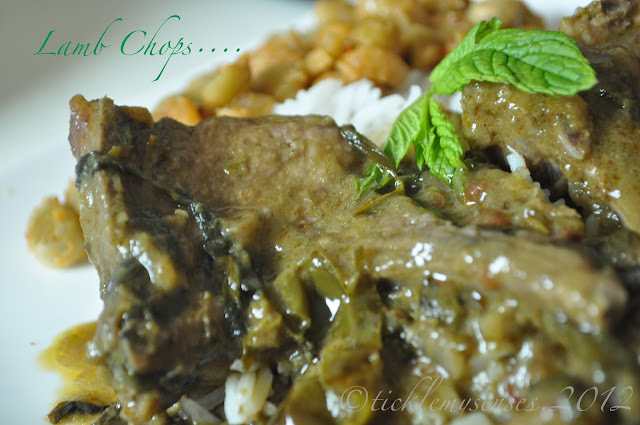 To make Lambs Chops Green Curry with Fenugreek leaves. Methi leaves: small bunch leaves removed. 1. Lightly dust chops with seasoned flour. 2. In a large vessel take 2 tbsps oil, fry slit green chillies and curry leaves for 2 minutes. Add the floured chops in a single layer, and fry for 3 mins on each side or till lightly browned. Then remove sealed chops and fried curry leaves and green chillies to a large plate and keep aside. 3. In same pan, add more oil add the methi leaves, fry for 2-3 minutes on high flame till almost crispy, then add *ready browned onions warm through ( see notes below), add ginger garlic paste and fry for 2-3 mins till the rawness of the ginger garlic paste is gone. Add the Mangalore green masala paste, fry for 2 mins, add the chopped tomato fry for few more minutes till the tomato softens. Add 2 cups of water, taste the gravy for salt, then add the sealed lamb chops. Close and cook on a gentle flame till done. Add vinegar/ lemon juice to taste. Check for seasonings. 1. Lamb chops sold in the UK tends to be very tender hence does not require to be pressure cooked. If using mutton or meat that is not tender, follow the above steps in a pressure cooker instead. 2. I use "crispy ready browned onions" in most of my cooking as it saves me a lot of time having to slice and then brown them on a stove top. Available in large packets in most superstores like Tesco's in the UK or in Asian stores. If you do not have ready browned onions, simply fry one large thinly sliced onion in a vessel with sufficient oil (Step 3), once browned, keep to one side of the vessel while you add sufficient oil to fry the methi leaves and allow it to crisp up, then add the ginger garlic paste to the fried onions and methi leaves and follow the rest of the recipe as given above.